Brisbane has become a city of inclement weather. Climate change sceptics will argue that there is no trend or cause for alarm in the bad weather we’ve experienced in the last year. But every drop of rain that falls out of season during the construction of my Monument to Moi falls more heavily in my mind and I’ve never felt more pessimistic about the likelihood of good weather. Especially as I’ve been waiting for the roof to go on. 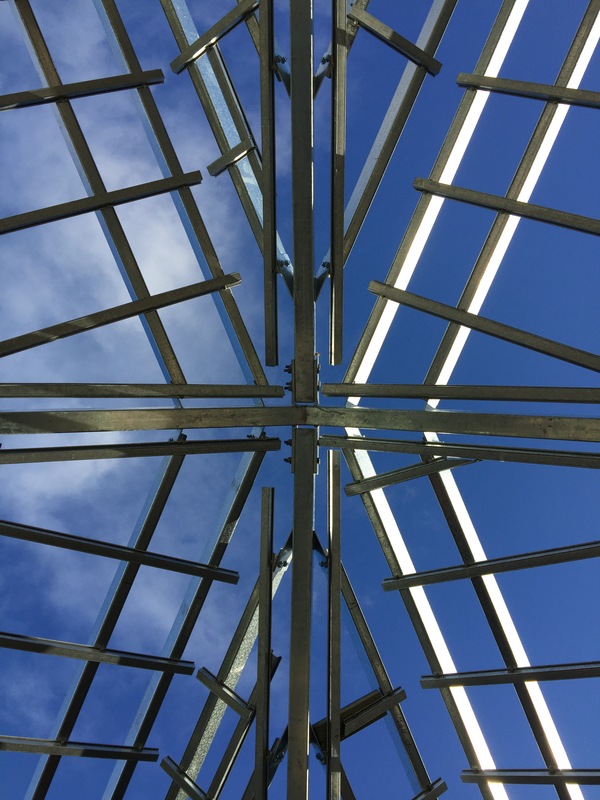 Though I love seeing the blue sky through the geometric genius of my roof structure, the flooring timbers grow more mouldy with every day of rain, which I’m told won’t affect them, but even so, I can’t wait for the roof to go on. There’s a reason that it’s taken a little longer of course. 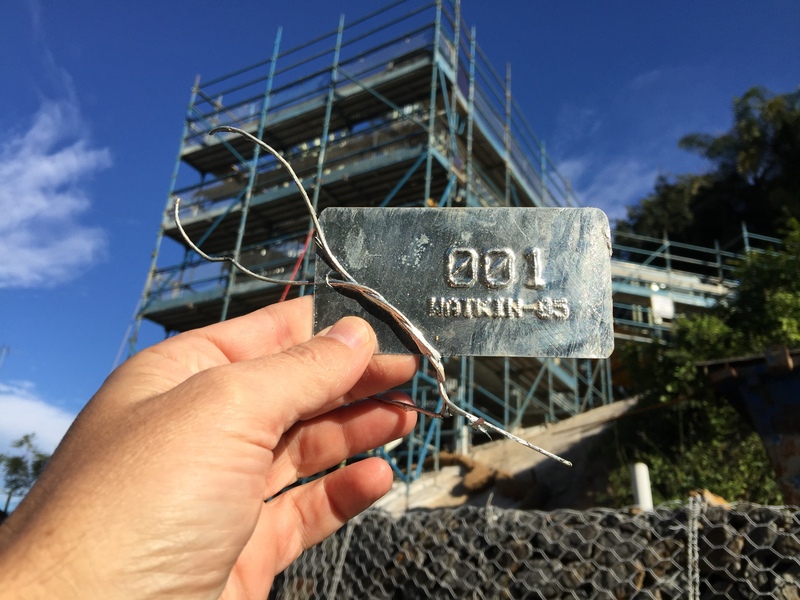 We’ve been waiting for the final pieces of steel to be delivered to the site and assembled. These are key pieces. 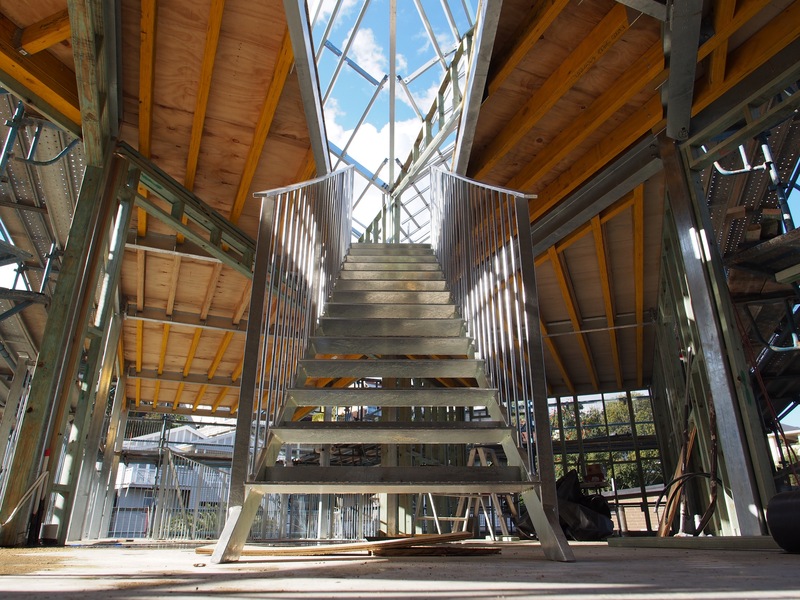 The interior stair, which is to be threaded through a hole in the roofing structure, must be dropped down through the upper floor to rest its feet on the lower slab. We had to leave a space for that. The riggers from Watkins seemed unfazed by the idea. They’re cool beyond words, those guys. 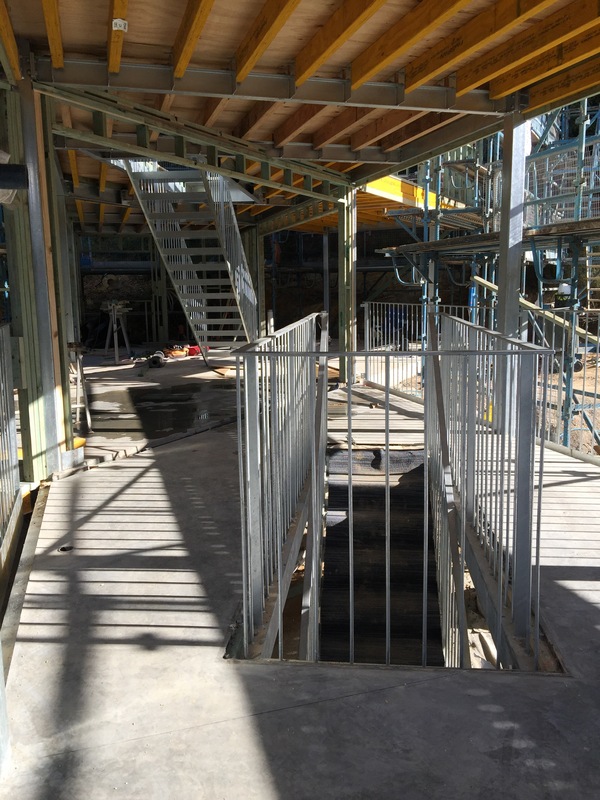 The balustrades, which have taken so much mental energy to conceive and design and then engineer are also to be delivered via this same route, threaded through the roof of the structure, which is surrounded by a fortress of scaffolding. That’s why it all had to come in through the top. There was no way in from the sides. 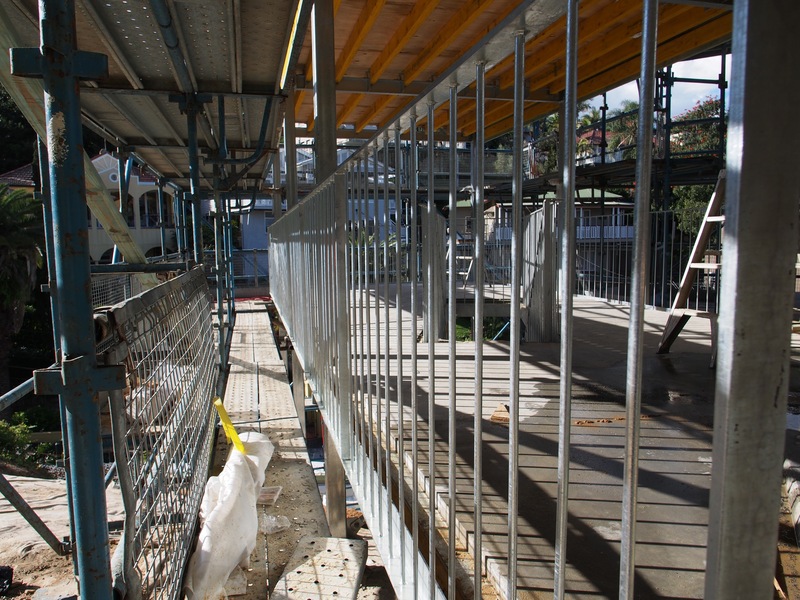 When all that galvanised steel balustrade arrived, I had another one of my epiphanies. I’ve had a few on them on this project. I’d always felt that the balustrade, designed as it was to visually disappear, would feel flimsy, unsettling to anyone standing on the verge of my deck. I discovered though, when it arrived and was bolted into place, that the feeling was the opposite of unsettling. The balustrade, if anything, felt enormously strong. I’m not going to say “over-engineered” because the effect is positive and that phrase would suggest that the balustrade looked heavy. It doesn’t. It looks light, but it feels secure. 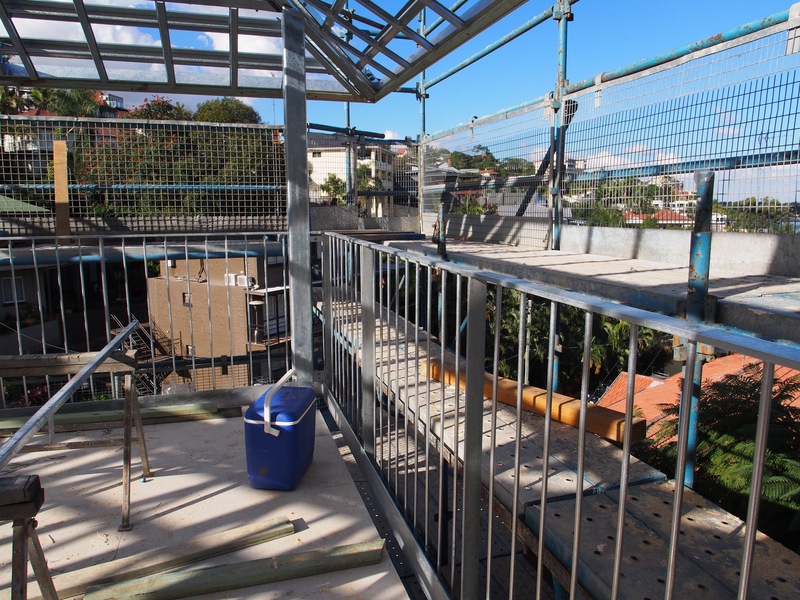 When I consider the other options I had on the table prior to my sign-off of the balustrade design, things like glass, or stainless steel cable, I’m glad I opted for the welded galvanised steel. It’s just more substantial and still elegant. I can’t wait now to see it from the street, when the scaffolding is dismantled and removed. Meanwhile, the other major piece to be delivered through the roof was the interior stair. This, if you remember from the design phase is the stair that rises to the top floor from beneath the kitchen bench. It punches through a hole in the floor and its structure links with the steel supports of the kitchen bench. I see how this will work now. But also, now that I can see this stair in concert with the other stair that rises from beneath the deck, I am starting to understand one of the key ideas in Shimada san’s design. The two stairs see each other for the first time. They like what they see. The stairs aren’t just transport mechanisms. They’ve shown themselves (to me at least) to be a focus for the entire living space. They dominate. I guess that’s why so much attention has been paid to how they look. At one point, several months ago, I was asked how safe I’d like these stairs to be. The question within the question was how “architectural” I’d like them to be, with regard to the fold-downs on the front of each tread. I opted for a fold down at the back only, leaving the front of the tread exposed. Trip up these stairs and you’ll get hurt. But look at them now. See how they float. I was prepared to risk it then, and I’m happy I did now. 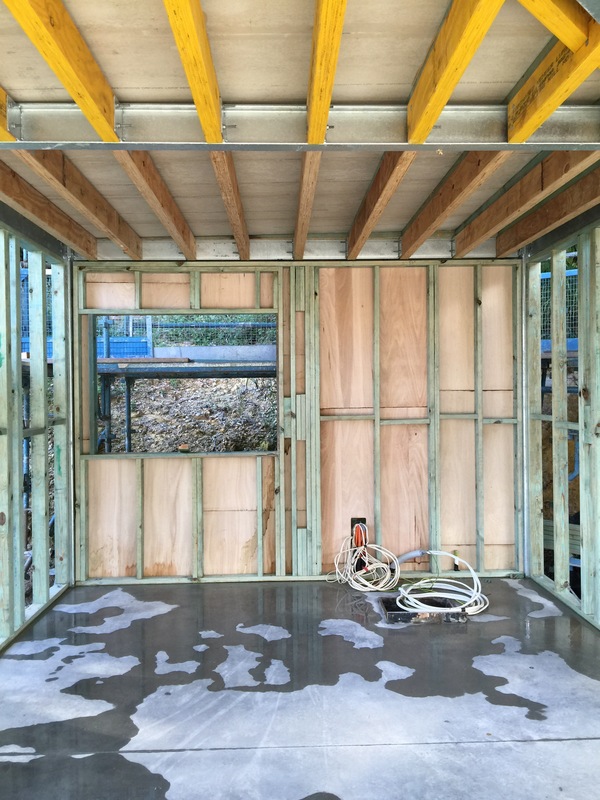 And now that all that steel has been delivered, it’s time to close in the house and start the process of creating rooms. Goodbye weather. It’s been bright. It’s been breezy. But the first of the walls are now up and soon, the roof will be on. Don’t worry though. There are windows and big ones at that. Big and square, but in true Shimada san style, they’re more hip than square. More on that later. For now I’m just all fingers and toes crossed hoping that the weather will remain fine until the roof goes on before the bad weather closes in again. There’s an unseasonal cyclone, the earliest on record, out in the Coral Sea as we speak. This entry was tagged architecture, Bligh Tanner Engineering, house, house design, interior design, japan, japanese house, minimalist, Phorm Architecture and Design, Steel, Steel frame, tato architects, yo shimada. Bookmark the permalink. ← You can’t walk around in your head.